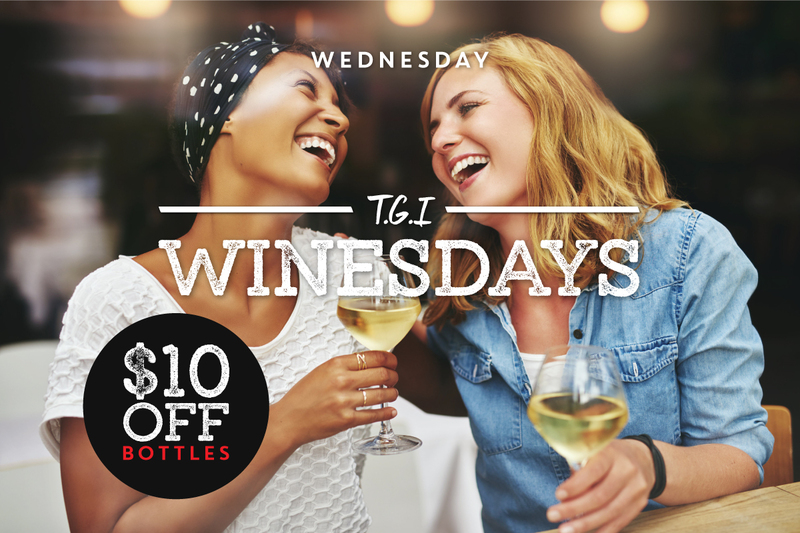 $10 off all bottles of wine. 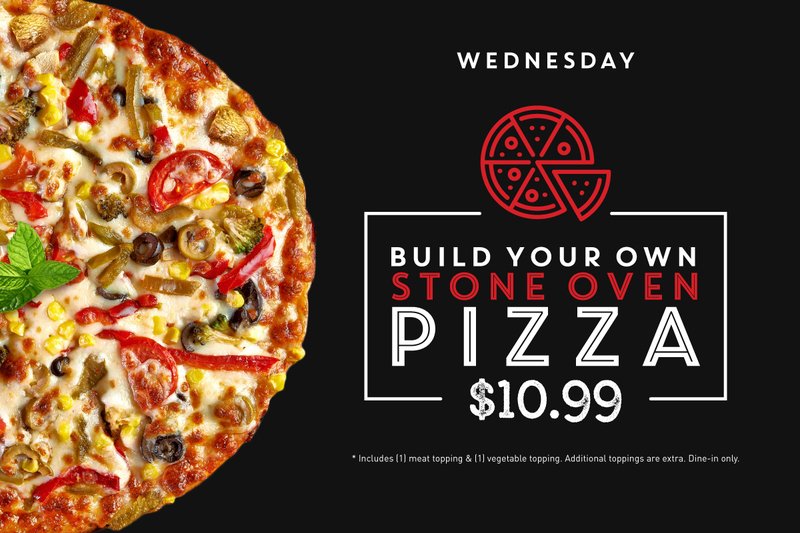 $10.99 stone oven pizzas. Includes one meat, one vegetable. 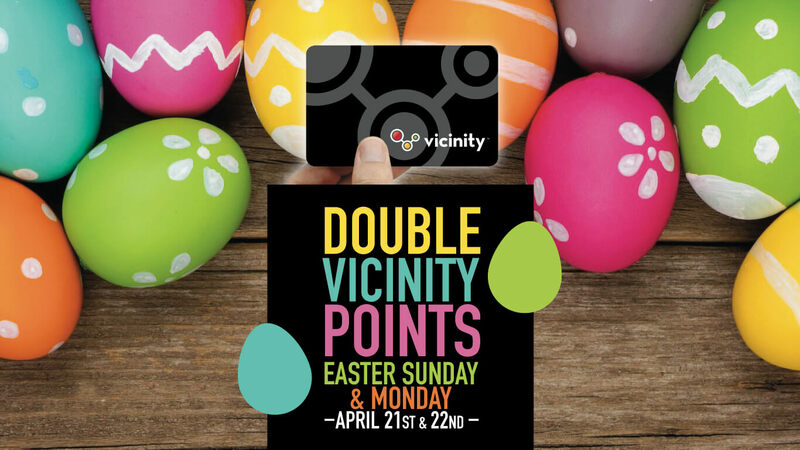 Dine in only, with the purchase of a beverage. Join us every Thursday for oyster night starting at 5 PM, as we feature a different premium oyster each month. 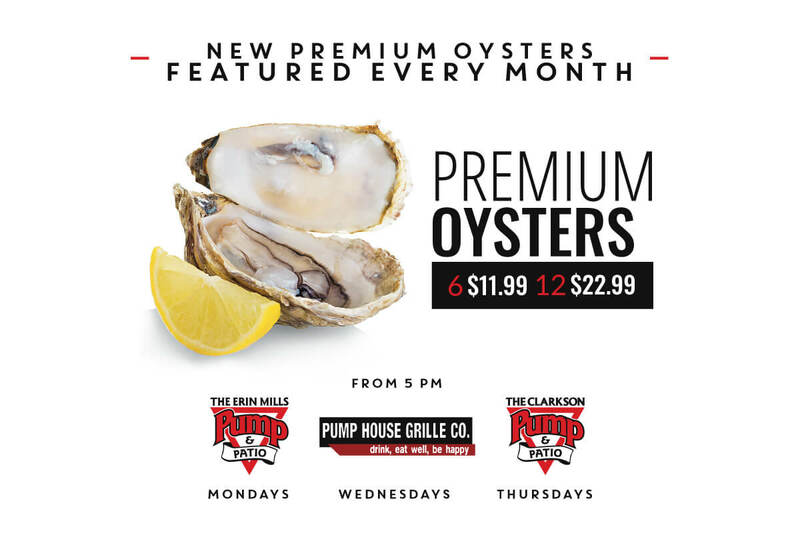 6 oysters for $11.99 or 12 for $22.99. It’s a shucking blast until quantities last! 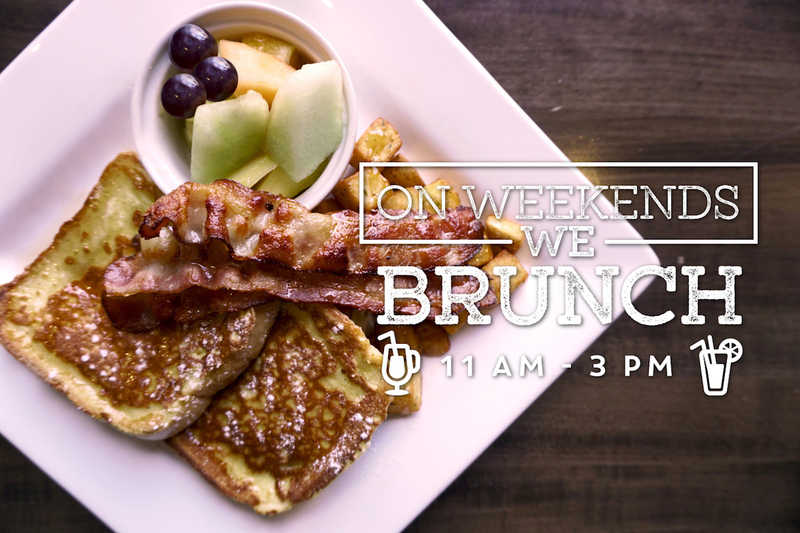 Join us for brunch every Saturday, Sunday and holiday Mondays from 11AM-3PM. Brunch items starting from $10.99. 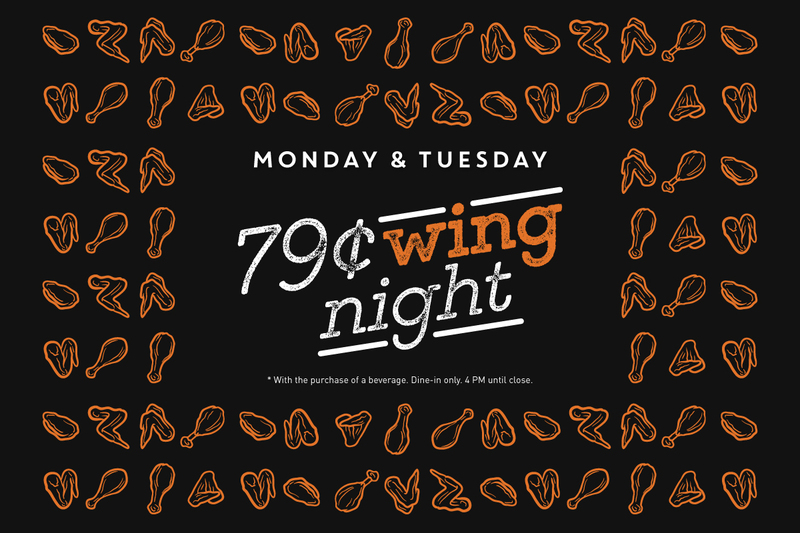 32oz mini pitchers starting from $10. 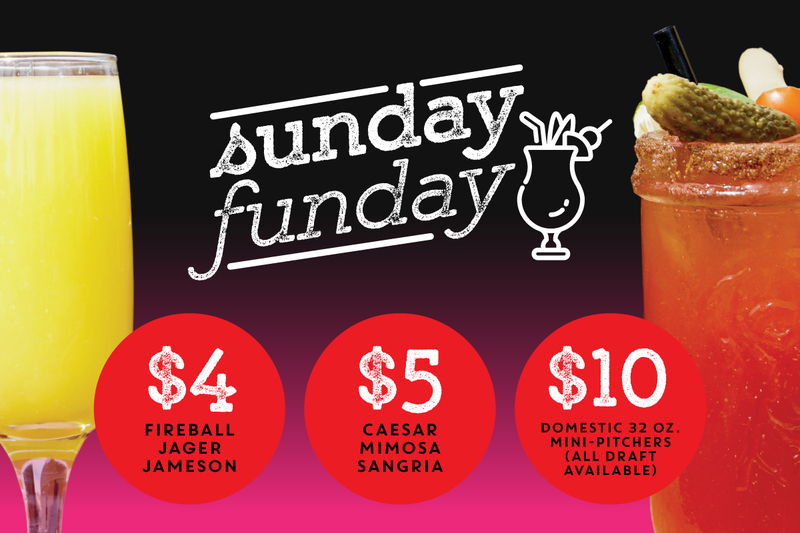 $5 Caesars, Mimosas and Sangrias all day. 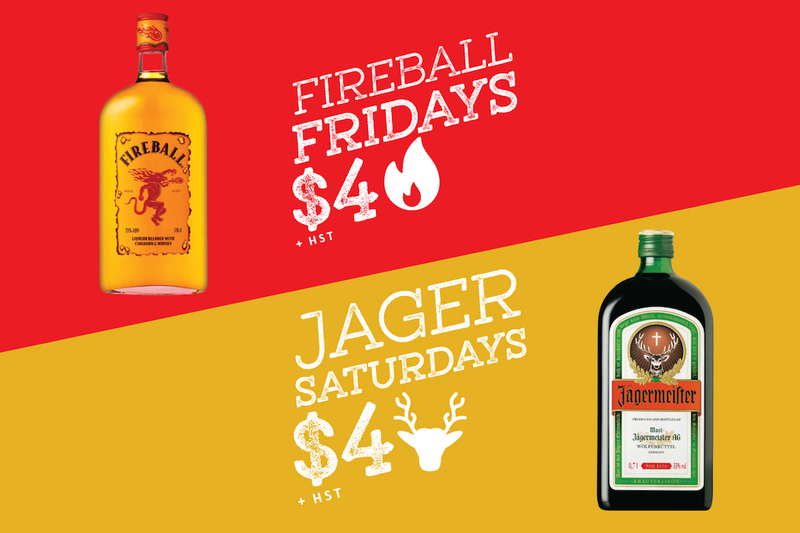 $4 shots of Jameson, Fireball and Jagermiester. Prepared in-house with the finest ingredients. Deep Bordeaux broth baked with Mozzarella and parmesan cheese. Grilled avocado's loaded with Panzanella salad. Sliced pear, double crème Brie, candied walnuts & a sweet spicy chilli drizzle, served on our stone oven pizza dough. Double battered dipped, with marinara sauce. Hand cut crispy battered pickle fries, served with buttermilk ranch aioli. Our house dip baked with blended cheeses, served with nacho chips. Lightly dusted, served with your choice of spicy tiger or cocktail sauce. Hand battered & served with a tangy marmalade dip. Beer battered cod nestled in soft flour tortillas with sautéed onions, peppers and house-made salsa. Plump & juicy chicken tenders sautéed in a spicy Thai sauce, topped with sesame seeds, spring onions. A warm blend of chicken, cheese, jalapeños, roasted red peppers & spring onions rolled in an herb & garlic tortilla, baked until golden brown, served with pesto sour cream. Bacon, green onions, blended cheese & sour cream. Yorkies stuffed with shepherd's pie and topped with melted cheese and gravy. Crisp lettuce, cucumbers, tomatoes, red onions, Kalamata olives & feta cheese in our house vinaigrette. Vine-ripened tomatoes, fiore di latte, fresh basil, extra virgin olive oil & balsamic drizzle. Arugula, apple, sweet roasted yam, pumpkin and sunflower seeds, feta, with honey ginger dressing. Grilled tiger shrimp, fresh avocado, mango salsa, beefsteak tomatoes, cucumbers & arugula in a house dressing. Cucumbers, tomatoes, Kalamata olives, red onion, feta cheese, house-made Greek dressing, topped with crispy fried calamari. Grilled chicken, beets, squash, Bermuda onions and candied walnuts tossed in a honey balsamic vinaigrette with arugula, topped with goat cheese. Jumbo tiger shrimp and chicken sautéed in a sesame vinaigrette with mushrooms and julienne vegetables, served over mixed greens, garnished with spring onions, sesame seeds and chow mein noodles. Bed of romaine, tomatoes, cucumber, onions, crisp bacon, shredded cheddar, egg, Catalina dressing. Fresh seasonal vegetables sautéed in a tangy Thai sauce with lo mein noodles, garnished with spring onions and sesame seeds. Fall off the bone and glazed with our own barbeque sauce, served with fries & coleslaw. Alaskan halibut lightly battered, served with fries & coleslaw. Atlantic wild caught salmon crusted with sesame seeds drizzled with an Asian sesame sauce, served with rice & grilled vegetables. Made in-house with our fresh vegetables & exotic spices, served over basmati rice with warm naan bread. Served with fries, soup of the day or harvest salad. Try our sweet potato fries, Greek or Caesar salad - Add $3. French onion soup - Add $5. 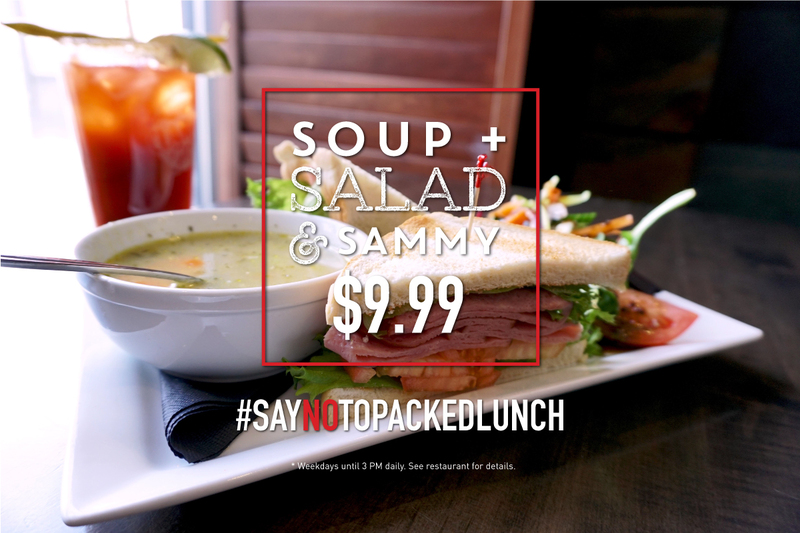 Tender free-range chicken, Canadian bacon, cheese, ham, lettuce, tomatoes, served on your choice or bread. Lobster, avocado, double smoked bacon, lettuce, tomato, Swiss cheese & tiger sauce. AAA Top Sirloin slow roasted & served on a garlic French stick with a side of au jus. Crispy chicken tossed in buffalo hot sauce with red onion, tomatoes, cheese and shredded lettuce. Sliced Angus prime rib, sautéed mushrooms, caramelized onions, melted mozzarella served on a garlic French stick with a side of au jus & horseradish ranch dip. Southern fried chicken, lettuce, tomato, bacon, Swiss cheese & a spicy yogurt buffalo sauce. Bao buns filled with Asian coleslaw, fresh cucumber, crunchy punchy pickled vegetables.  Choice of: Sweet Chili Chicken, Dynamite Shrimp, Hoisin Pork Belly or Shanghai Veggie. 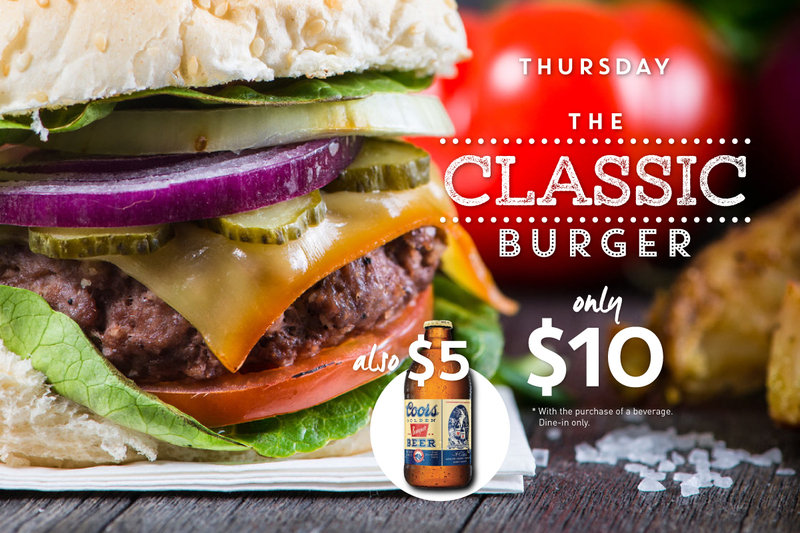 Choice of: Beef, Chicken, Turkey, Garden Patty Garnished with lettuce, tomato, pickle & red onion. All burgers are served with a choice of fries or daily soup or house salad. Try our sweet potato fries, Greek or Caesar salad - Add $3. French onion soup - Add $5. Our homemade signature burger with melted aged Canadian cheddar cheese. Cheddar & choice of peameal or smoked maple bacon. Topped with Swiss cheese, sautéed mushrooms & onions. Topped with dusted jalapeños & onion strips and aged cheddar. Add a split & grilled hot dog right on top of the burger, cheese, pickles, onions, tomatoes. Ground veal and beef wrapped with round steak, sautéed mushrooms, grilled onions, mozzarella. Montreal smoked meat, sauerkraut, Swiss cheese, lettuce & bistro sauce. Garden burger, sliced avocado, topped with brie cheese. Gluten-free crust available - Add $3. Buffalo mozzarella, fresh basil & pomodoro sauce. Pepperoni, mushrooms, green peppers, mozzarella cheese, served with our homemade sauce. Double pepperoni, tomato sauce, cheese & more chese. Spicy soppressata, spicy capicola, pepperoni, hot peppers, mozzarella & pomodoro sauce. Meatballs, onion, banana peppers, mozzarella and tomato sauce. Buffalo grilled chicken, garlic parmesan sauce, onions and mozzarella cheese, ranch drizzle. Garlic sauce, goat cheese, kalamata olives, tomatoes, onions, roasted red peppers, arugula, olive oil & balsamic drizzle. Bacon, ham, pepperoni, pineapple and hot banana peppers. All pasta dishes are served with baked garlic crostini. Gluten-free pasta available - Add $3. Atlantic lobster meat and jumbo black tiger shrimp in a spicy tomato cream sauce. Chicken, cremini and shitake mushrooms, Italian parsley, black truffle oil in a white wine cream sauce. Tossed in a traditional rich alfredo sauce, topped with your choice of grilled or blackened free-range chicken. Rigatoni in a classic Bolognese sauce accented with Italian Chianti ground sausage. Chicken fingers, mozzarella sticks, tickled pickles, tempura cauliflower, garlic cheese bread, fries, served with assorted dips. Served with blue cheese or ranch dip.